Easygenerator has created a free tool to assist you in creating learning objectives: the Learning Objective maker. It is available in Beta and we are looking for people who want to test it and provide us with feedback. At Easygenerator (the e-learning software company) we not only try to deliver a state of the art e-learning authoring tool, but we also try to help people in creating better and more effective e-learning as well. We do free Q&A session, have online courses on how to create proper e-learning and now we have the Learning Objective maker. It is available in Beta and we are looking for people who want to test it and give us feedback (see bottom of this post). In order to create effective e-learning you need to have clarity on your learning objectives. 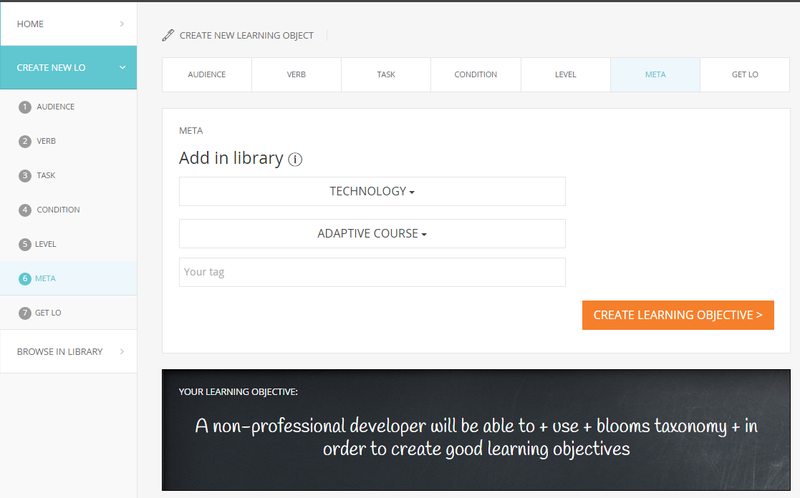 Easygenerator already supports building your courses on learning objectives. Most of our users are non-professional developers (teachers, trainers, Hr people). We discovered that they find it very hard to create a proper learning objective. Which gives them a bad start in the creation process. A large part of our users has never heard of things like Blooms taxonomy or does not have any other any other didactical background. Yet we want to help them in creating better learning objectives and better e-Learning. So we decided we needed to build something to support them. We created a free tool: the Learning objective maker. It can be used by anyone, you do not have to use easygenerator. The learning objective maker is available for free on our website, it is free now and it will remain free in the future. The goal is to offer a few simple steps that will help you in creating proper learning objectives, based on Bloom’s taxonomy. it also allows you to share your learning objectives with others and to re-use learning objectives created by others. The tool is live, but it is not yet perfect. We are looking for people that want to test this tool and give us feedback so we can improve it. All you need to do is go to the Learning Objective maker and start create some objectives. Any feedback is welcome. You can give us your feedback through this form.